The media ran with a narrative that they knew was false and has no obligation to clean up the mess. Most clear thinking people rejected the idea that Michael Brown was executed in the street with his hands up while he screamed “don’t shoot” a long time ago. When the forensic evidence was made public during the trial, that narrative was completely debunked. This did not stop a large number of racial agitators from continuing to spread the myth long after the St. Louis County District Attorney’s office released their findings. The list of guilty parties is quite extensive. NFL players, politicians, and many celebrities all clung to the story regardless of the facts that came out. The most outrageous example was Al Sharpton, who recklessly peddled the idea of vigilante murderous cops roaming the streets hunting down African-Americans. Eric Holder’s Department of Justice promised they would get to the bottom of this “senseless” killing and immediately opened a hate crime investigation into the matter. The results of that investigation were finally released, and although the DOJ published a scathing report against the Ferguson police department, accusing them of institutional racism, the Darren Wilson story was completely corroborated. The riots that followed the Ferguson decision cost the city millions of dollars, Darren Wilson will never be able to show his face in St. Louis again, and race relations in America were irreparably damaged by the events in Ferguson. They weren’t damaged by the actual interaction of Brown and Wilson, they were set back by the false hate crime narrative that the mainstream media pushed without focusing on any of the facts. There is racism in this country, but there is also a very troubling form of reverse-racism that is metastasizing in the media who has refused to report any truth that contradicts it’s own personal mission. 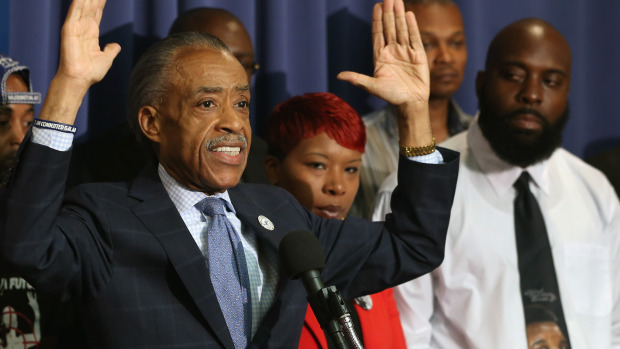 Hands up, don’t shoot was a lie. There is no debate about that. Yet somehow, it became the face of an entire movement. Al Sharpton and his cohorts knew exactly what they were doing when they pushed this false narrative. The forensic evidence was indisputable and it never changed. The admission by the DOJ that race was not a factor in this crime should be national news, just like the initial shooting was. The first story on every nightly national news program should be reporting on the government’s revelation that race did not play a factor in this crime, but it wasn’t. Why? It’s simple. The media doesn’t care about a police shooting where the cop followed the law, they only care about police shootings that can be used as fuel for the racial division fire that they find ways to fan at all costs. Racism is alive and well, but it’s not always directed in the way most people think. Megan Kelly and Dianna are RIGHT!! The Demoncrat man is a LIAR!! “UNITED WE STAND WITH ISRAEL-YISRAEL AND OUR JUDEO-CHRISTIAN UNITED STATES OF AMERICA, DIVIDED WE FALL”! !